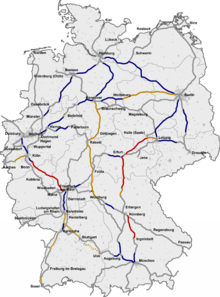 The ICE (InterCityExpress), is a category of high speed trains, which are operated by the Deutsche Bahn (in English: German Rail) since 1991. There are other (upgraded) lines where the trains can reach 200 km/h. Some new high-speed lines are under construction, some are in planning. ICE trains are also travelling to Austria, Belgium, Denmark, France, The Netherlands and Switzerland. Some of the destinations in other countries are: Aarhus, Brussels, Utrecht, Liege, Arnhem, Basel, Bern, Salzburg, Linz, Metz, Innsbruck, Amsterdam, Paris, Zürich and Vienna. Wikimedia Commons has media related to ICE. This page was last changed on 9 March 2015, at 18:52.